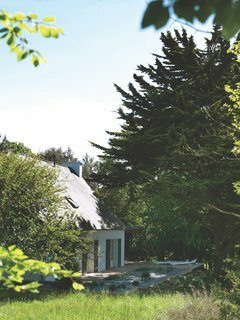 Architect Jean-Luc Etienne updates an old stone cottage near the coast of Brittany, France, with a glass extension and Vipp kitchen. 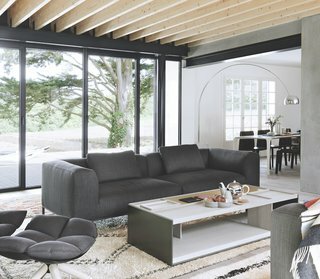 Built in 1927 and renovated in 2014 with a contemporary, steel-and-glass addition, this stone retreat sits in the small commune of Plévenon near France’s picturesque Brittany coastline. The remodel was carried out by architect Jean-Luc Etienne, who wanted to create a haven where he, his partner Vlastimil Spelda, and his partner’s twin brother Vladimir can escape the hectic urban pace of life in Paris. Kayaks wait to take the homeowners on an outdoor adventure. 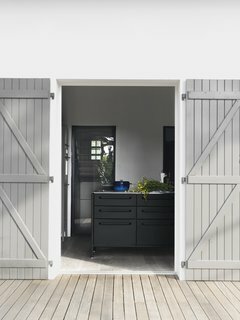 The Vipp kitchen makes use of a modular concept with four basic forms: island, island with seating, wall, and tall modules. 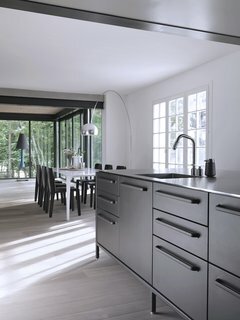 The 2,153-square-foot house spans two levels and includes four bedrooms, two bathrooms, an open-concept living space that looks out to panoramic views of the forest, and a streamlined kitchen from the Danish design brand Vipp. 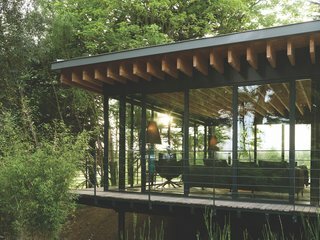 The glass-and-steel extension allows the homeowners to embed themselves in the natural environment. "Ten years ago, we came to the region as tourists to admire the coastline of Fréhel," says Vlastimil. "By chance, we passed a local real estate agent hanging up recent postings, and there it was." 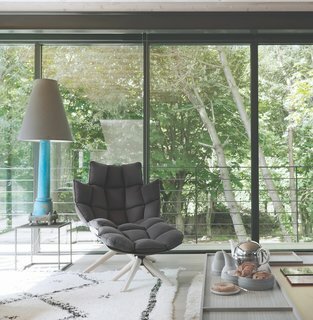 In the living room, a B&B Italia sofa and chair and Arco Floor Lamp rest on a Beni Ouarain rug. 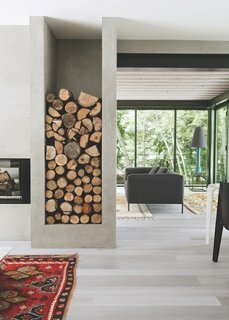 Built-in storage for firewood allows the homeowners to stack logs by the fireplace. The dining area is just steps from the outdoors. A B&B Italia dining table and chairs create a minimalist setting. The Vipp kitchen is raised on legs for easy cleaning. At the time of purchase, the classic Breton stone house was in poor condition. It was not the house that won them over, but rather its idyllic surroundings. 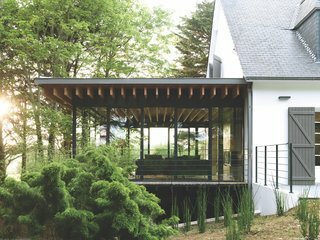 The property was nestled amid tall cedar, apple, and maple trees; to ensure that would always be able to enjoy the green views from the house, the trio also purchased the field next to house, so they could create the new extension. A Husk Armchair by Patricia Urquiola provides a cozy perch. 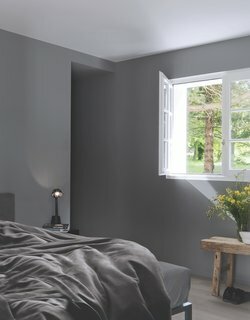 The table lamp is made from an old boat mast, and the gray ceramics are also by Vipp. 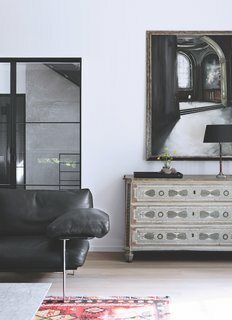 The vintage dresser was found in Saint-Malo, a historic port city in Brittany. Etienne’s idea was to transform the old house into a contemporary retreat that would have the feel of a cabin in the woods. After adding the steel-and-glass box to the existing stone structure, he reconfigured the interior floor plan and relocated the kitchen and bathroom to better capture the evening sunlight. A bedroom window frames forest views. "We didn't want to extend the house in the old-fashioned way with the same look and material," says Etienne. "We did the opposite by adding a 323-square-foot glass cube supported by steel beams to the existing stone construction. This way, we invited the most important asset of the area inside—the wild nature." 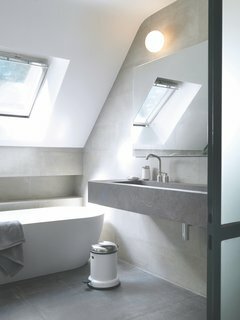 A skylight allows natural light to flow over the freestanding tub. The taps, soap dispenser, and pedal bin are by Vipp.